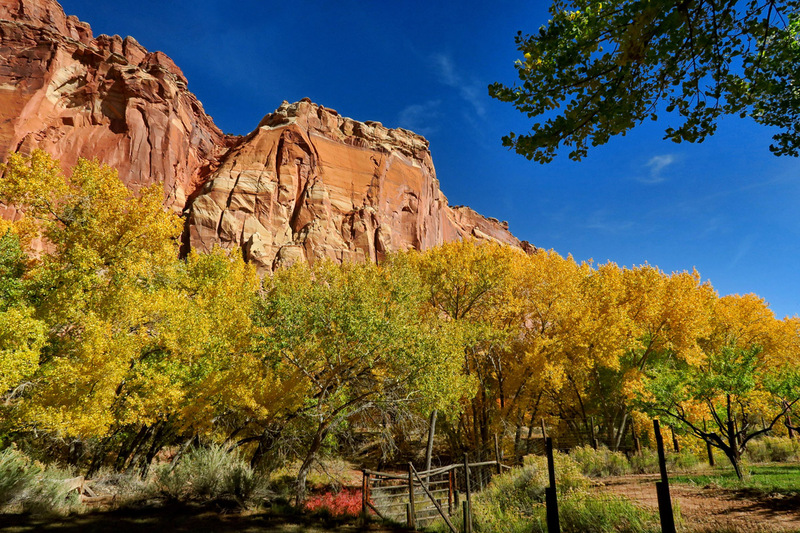 I carefully timed my visit to Capitol Reef to hit the cottonwood season. Sure, there is the perfect, crisp cool fall days. And the promise of lighter traffic once school is back in session. But the main reason I was really longing to return was to try to ride the golden wave of autumn. There is something about the brilliance of those giant cottonwood trees that just mesmerizes me. And if my timing is right, I can ride that golden wave all the way down to Zion. I love seeing them in the early stages of chlorophyll loss when their leaves are a bright lime green, turning almost a day glow yellow like the colors of my Endless Summer blacklight poster. In this early stage, leaves are variegated where the tops of the trees are starting to turn, but the lower branches hang on to their chlorophyll just a little longer. 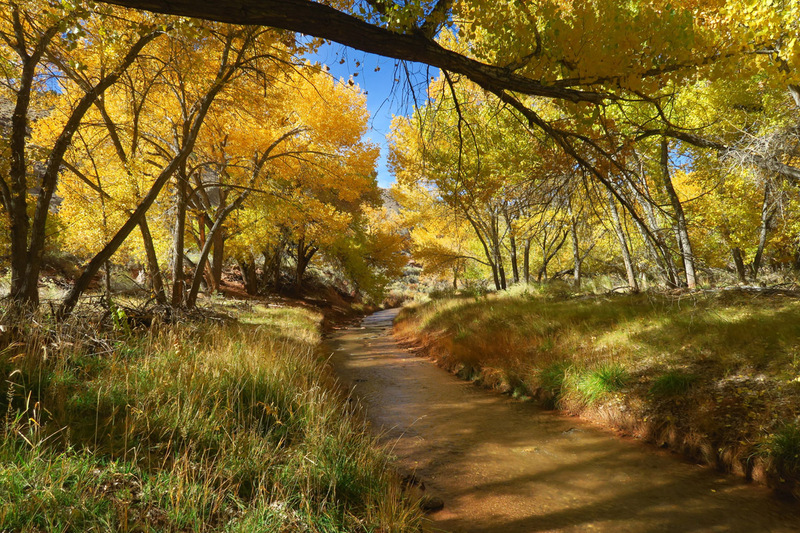 When I first arrived at Fruita Campground, I was delighted to see the trees at this initial stage, thrilled that my timing seemed to be just about perfect. Every time I passed the visitor center, there were people stopped across the street taking pictures of this magnificent cottonwood. 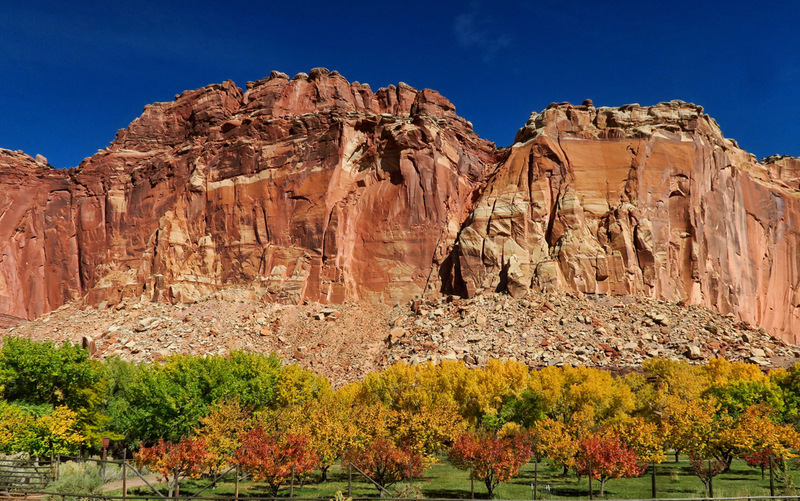 There are almost 3,000 fruit trees planted in the orchards in Capitol Reef, many by the early Mormon settlers. The perilous lure of staying in the Fruita Campground is the Historic Gifford Homestead where they sell “mini-pies” made with fruits from the orchard in the park. Peach, Apple, Cherry, all locally made with flaky crust. One must get there early, though, as they often sell out by early afternoon. I learned another treasured tip when I went early for my long-awaited peach pie as I arrived just as the delivery van was pulling out. If you get there right at 8:00am, the pies are still warm from the oven. Is a peach pie for breakfast any worse than granola over fruit or a biscuit with fruit jam? I think not! 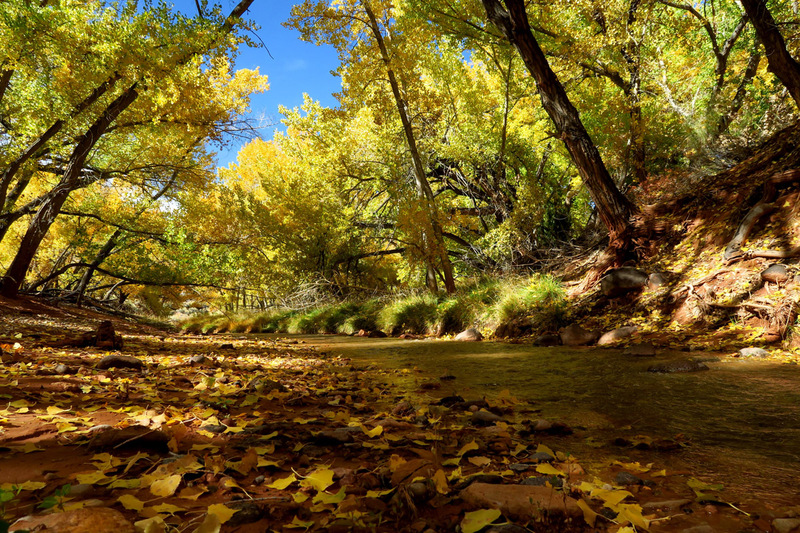 But I disgress…back to the cottonwoods. It is indeed a lovely spot, and no one else around. 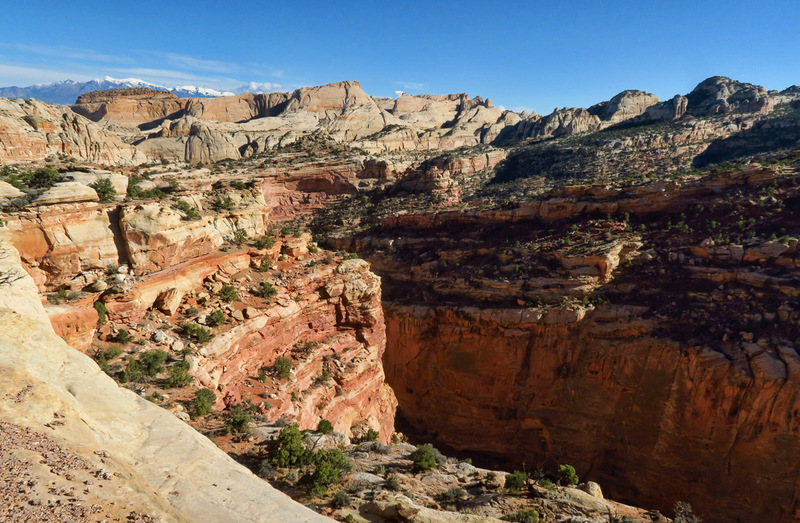 The first eight miles of Capitol Reef Scenic Drive are paved, and offer phenomenal views of the Waterpocket Fold. 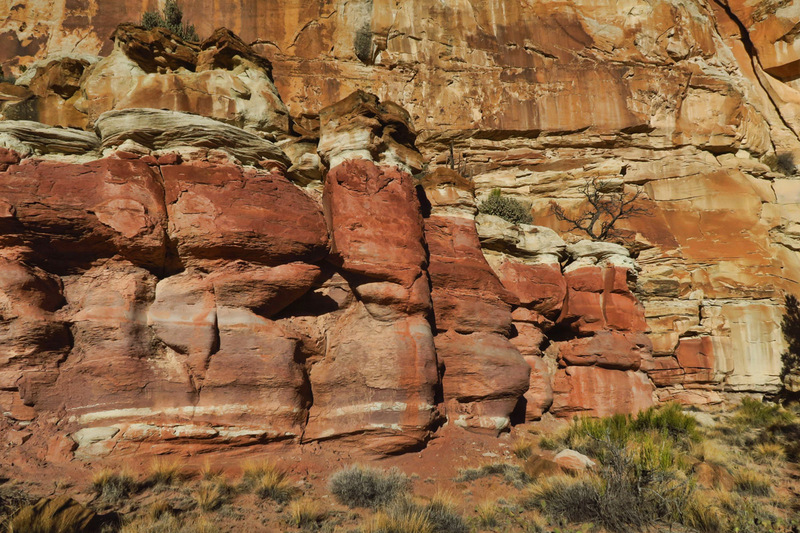 The heaved western side of the Waterpocket Fold is 6,000 ft higher than the eastern side due to the warp, exposing through erosion a layer cake of different sediments. 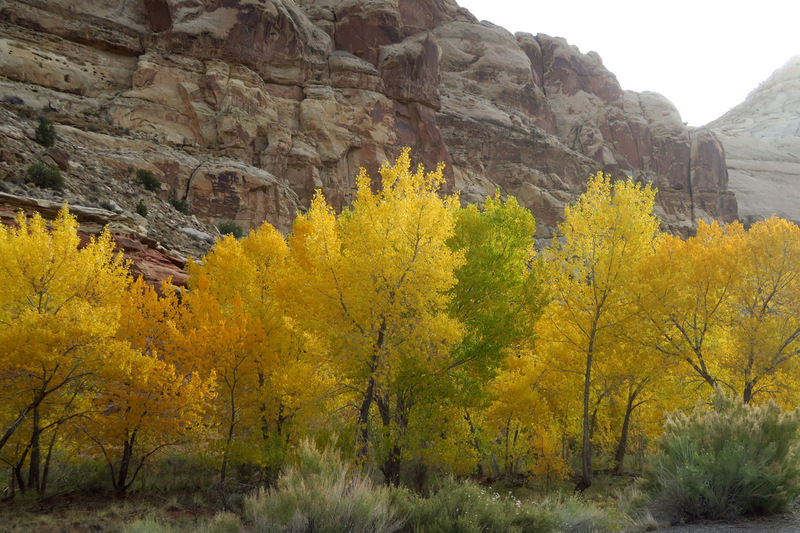 During the nine days I spend in the Fruita Campground, the day glow colors ripen into radiant egg-yolk yellow. Standing beneath these giant trees, their lemony-yellow leaves back-lit by the sun warms me to my core, and I can’t seem to get enough of them. I enjoy watching their subtle changes day over day until by my ninth day, most of them are approaching that antique gold color, the patina on the leaves dulling just slightly, indicating they are nearing Nature’s grand finale. 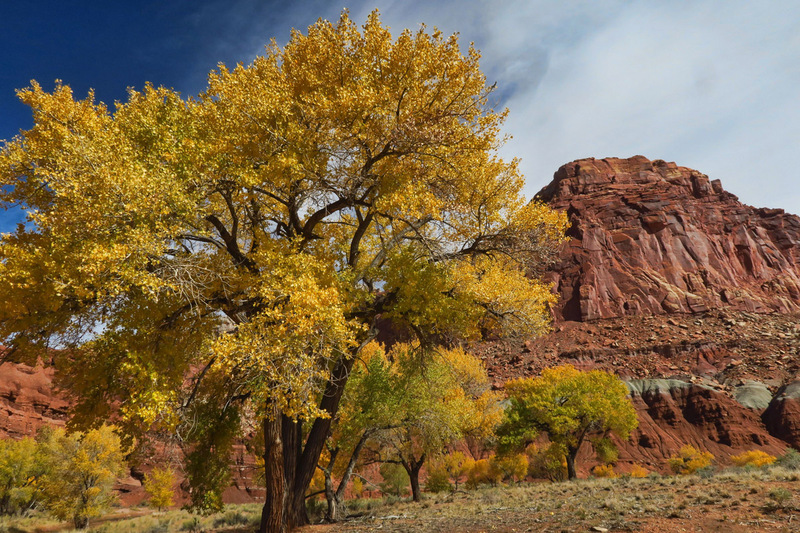 There are a couple of historic cottonwoods in the park that are over 100 years old. According to park historians, one was planted in 1886 and the other in 1905. 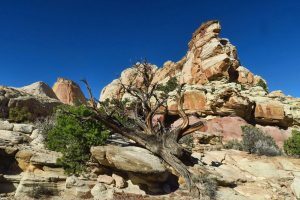 These trees have far outlived the life expectancy of a cottonwood, which is typically 70 to 80 years, and as a result, have grown to a circumference of 23 ft. 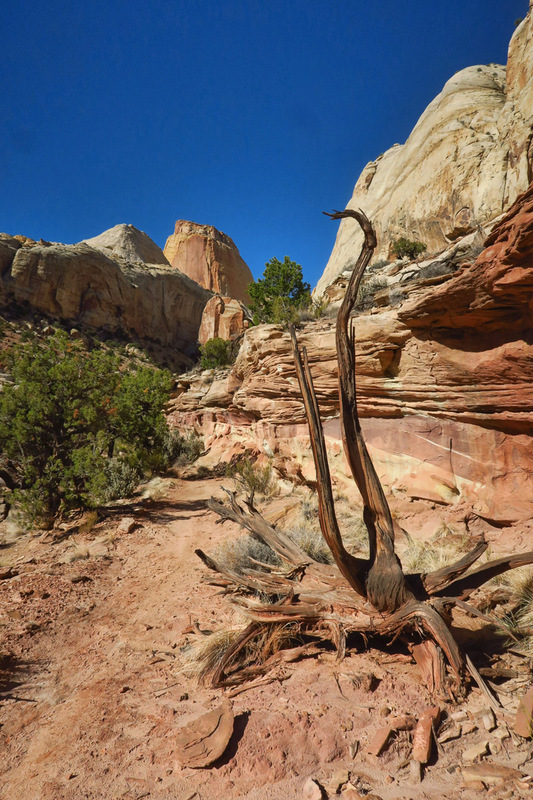 The oldest of these two trees is known as the “Mail Tree,” as early Fruita residents built a collective wooden mailbox beneath the shade tree. Toward the end of the paved section, one gets a first glimpse at the feature known as the Golden Throne. 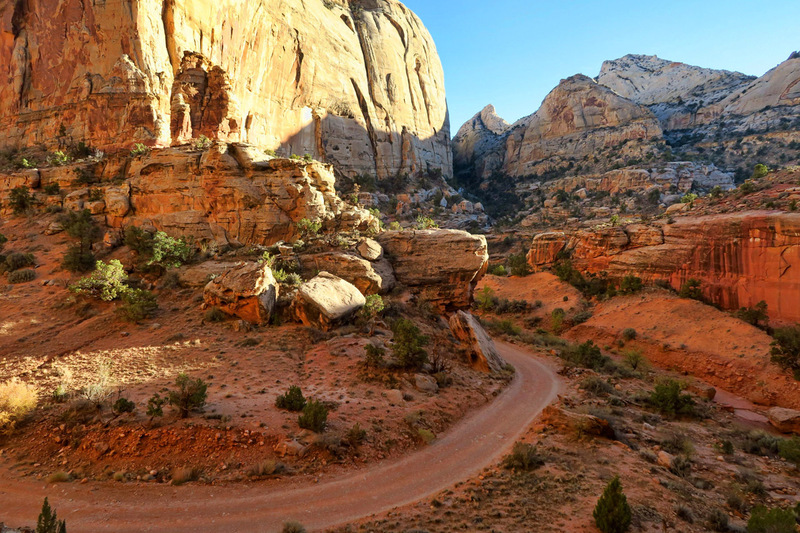 The final two miles of the Scenic Drive are gravel, and cut right through Capitol Gorge. This section was actually a through road from 1884 to 1962. The drive now ends and becomes a trail through the wash. 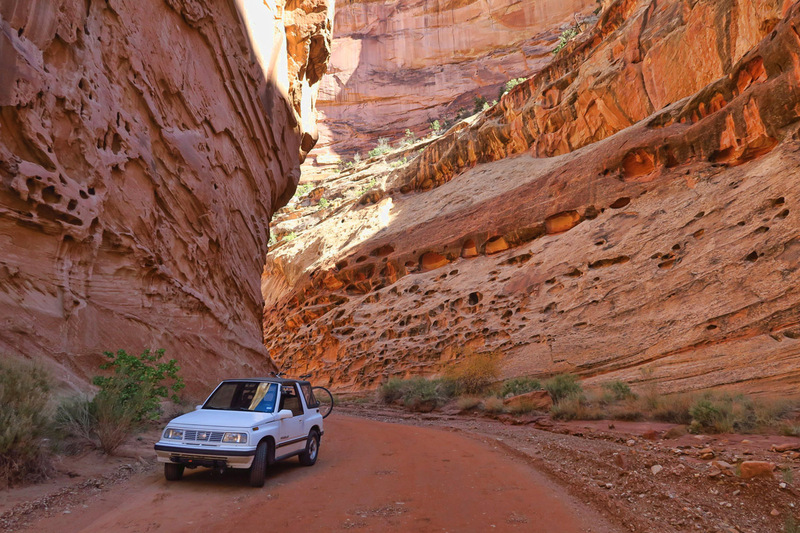 The Tracker would have made a great adventure-mobile commercial back in 1994, doncha think? There’s not a bad view in any direction from the eight-mile scenic drive. 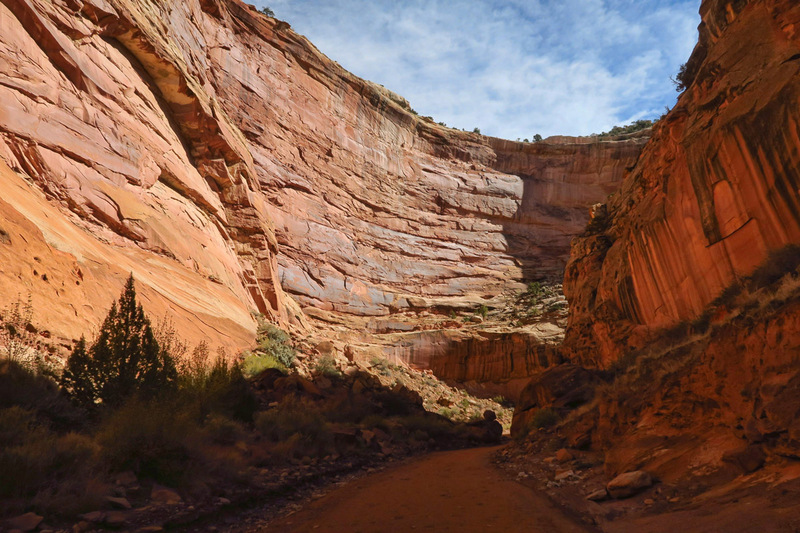 The further one goes into the canyon, the more beautiful it gets as the walls narrow down and get higher. 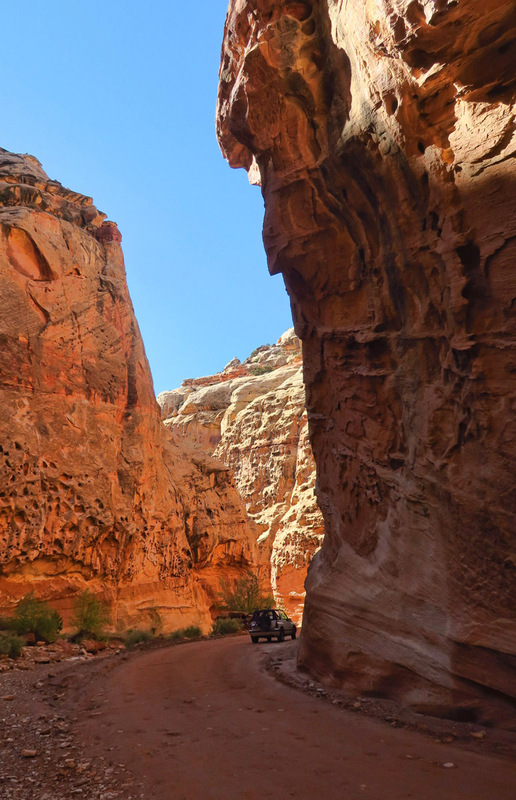 At one point, it’s like a slot canyon for cars, and I am stopped by a woman who asks me to wait so she can film with her iphone while her husband drives through the canyon in his big-assed truck. I always wonder what people will do with that footage shot in the moment. 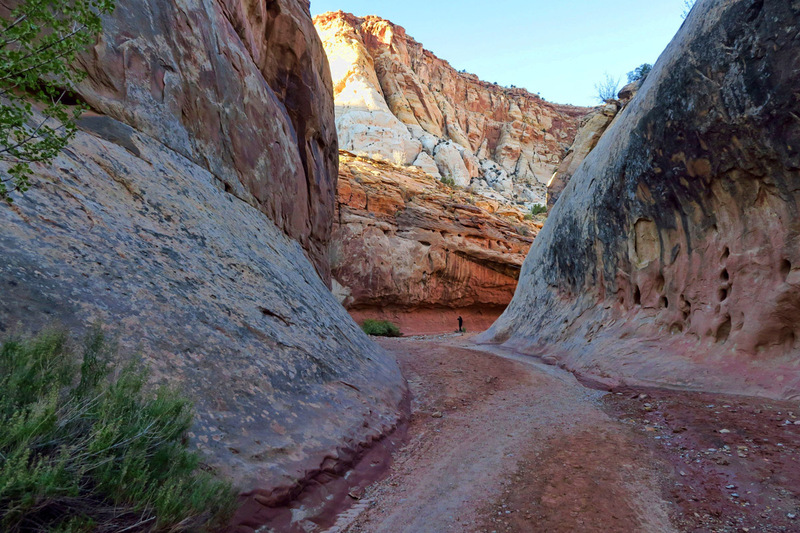 At the end of the dirt road, there are a couple of fun hikes. 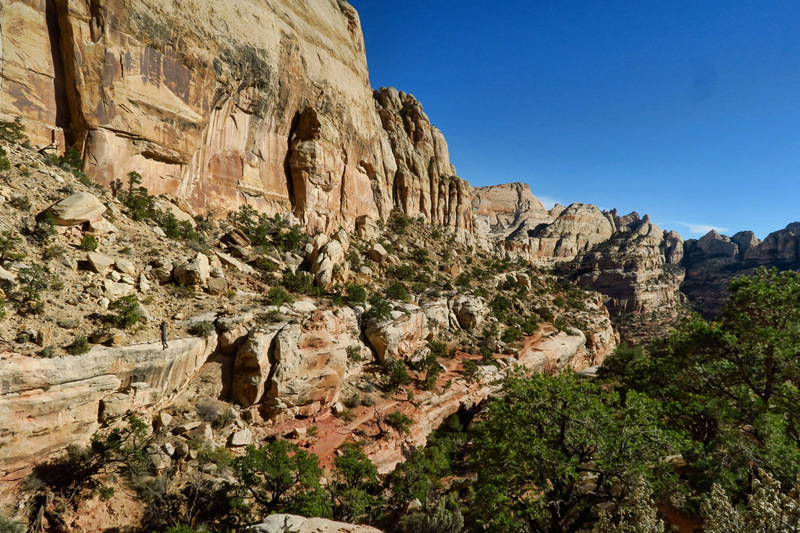 Capitol Gorge follows the wash, while the Golden Throne trail climbs up for views overlooking Capitol Gorge. 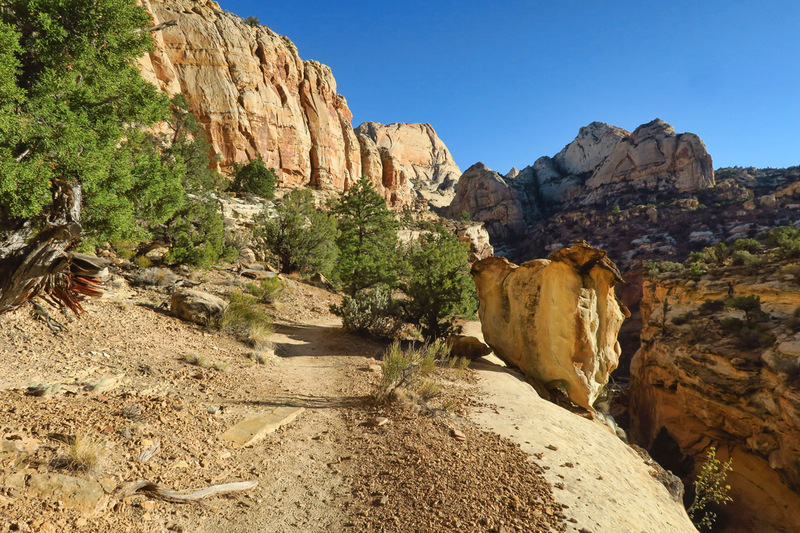 The Golden Throne trail is 4 miles RT with a 730 ft elevation gain. The trail follows the canyon rim and offers some stunning scenery. Golden Throne Trail overlooks a portion of the Scenic Road below. 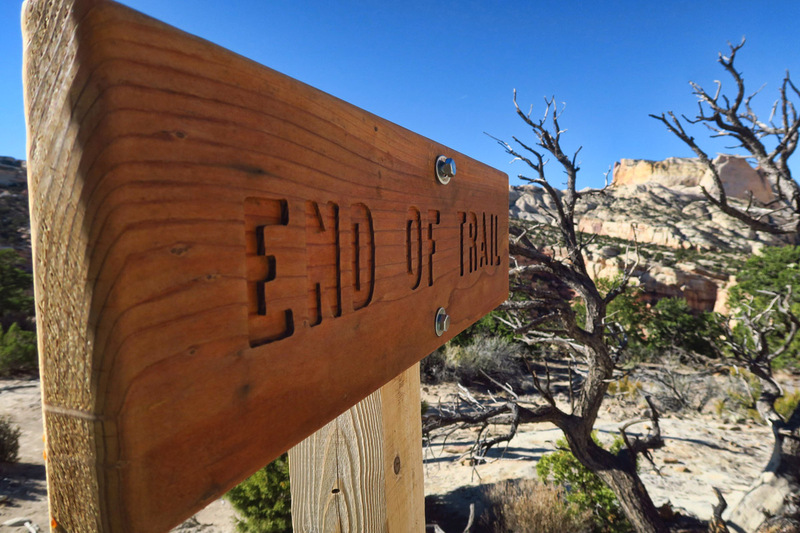 This trail offers great overlook views. At the end of the Scenic Road is a trail head for two very different but equally interesting hiking trails. The Golden Throne trail is a four mile round trip up above the canyon rim, while the lower trail follows the old Capitol Gorge road that was used as a route through the canyon up until 1962. Mormon pioneers took eight days in 1884 to clear the first road through the Gorge, and settlers had to remove heavy debris after every flash flood. Early travelers recorded their passage on the canyon walls at the Pioneer Register, where you can see names dated back to 1888. 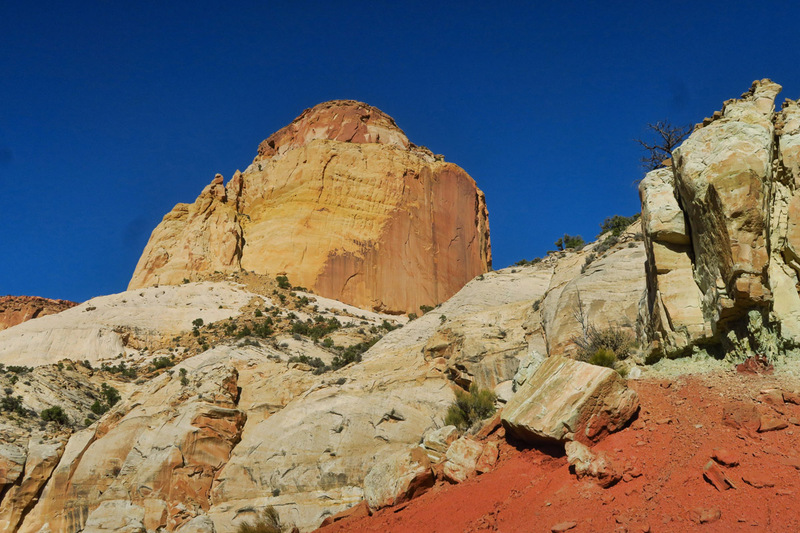 Aptly named “Golden Throne” is a 1,000 ft monolith of Navajo sandstone. Snow covered Henry Mountains in the distance. 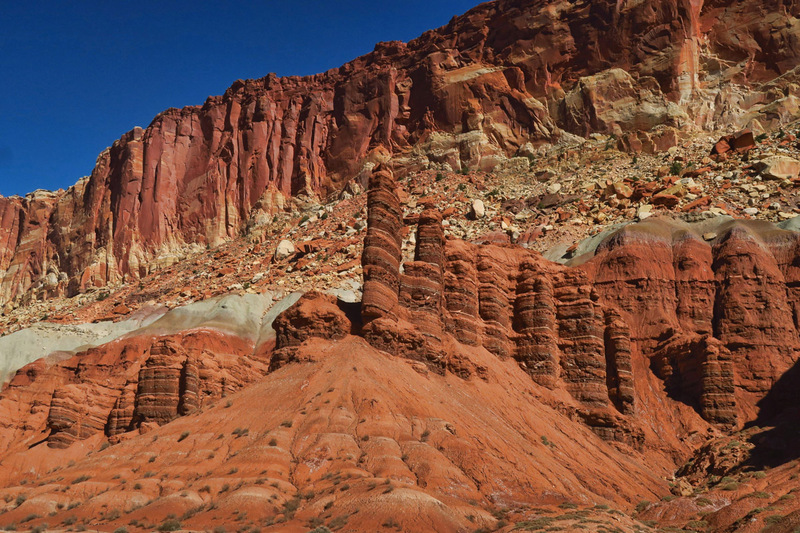 While the red Wingate sandstone tends to erode into cliffs, the Navajo sandstone erodes into domes. 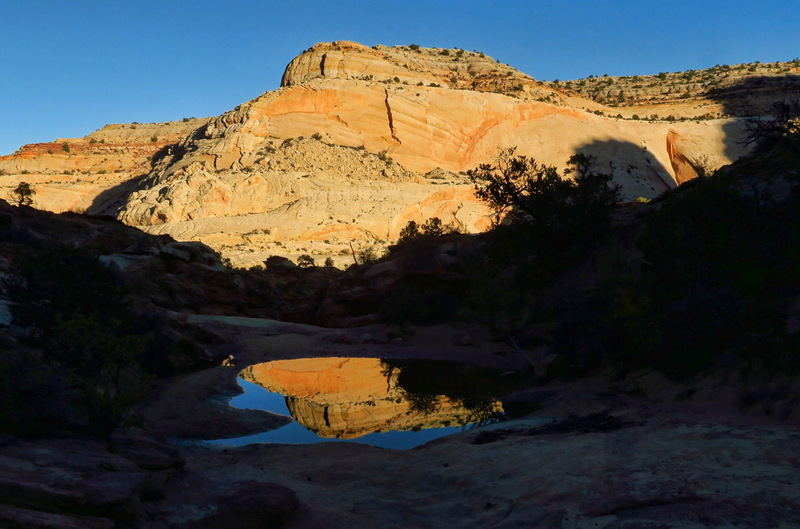 If the 4 mile hike is not enough walking, one can also do the 2 mile RT Capitol Gorge hike. 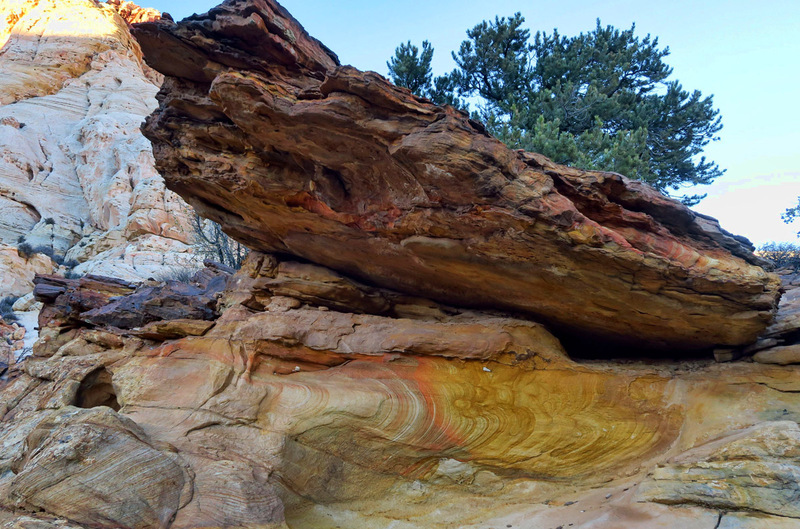 Some beautiful colors in the base of this rock. It’s a gorgeous day for hiking. With the exception of one day of light rain, the weather has been perfect during my stay. 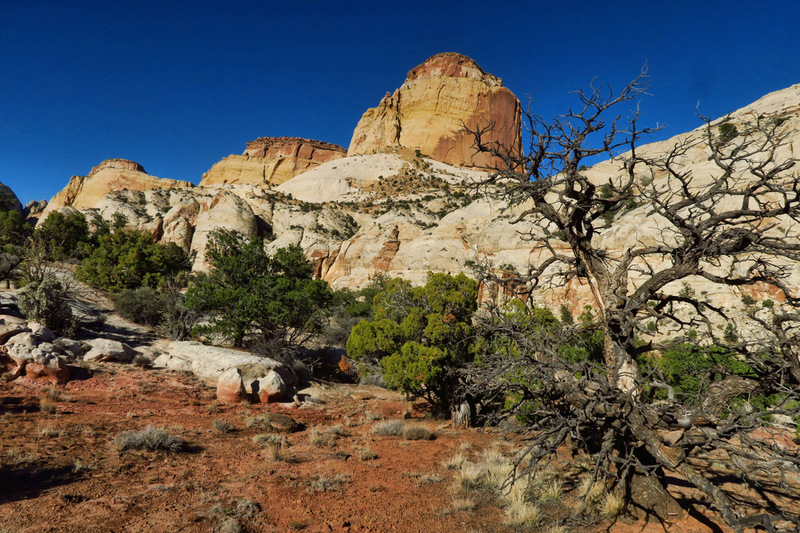 Though the highs have only been in the mid-sixties, it’s great hiking weather. Besides, I am happy to put on an extra layer if it means fewer people. I find myself at the foot of the Golden Throne… all alone. This entry was posted in National Parks, Utah and tagged Capitol Gorge, Capitol Reef National Park, Golden Throne Trail by Suzanne. Bookmark the permalink. Honestly, I’m not sure if I enjoy your photos more or your words that make me feel like I’m right there. I love that the woman at the Visitor Center is the granddaughter of the man who lived and worked there. So wonderful for her to have those memories of her childhood surrounding her. Speaking of sitting on a pumpkin, the pumpkin pie there is the BEST pumpkin pie I’ve ever eaten. Peach is my next choice. Thanks for this post…sounds like a perfect 9 days. Good grief it’s beautiful there. Must go back. You certainly hit the colors just right! I pays to talk to someone who knows the area and where to go. Could you imagine growing up and playing right there in the park? Warm peach pie for breakfast….that sounds too good, there must be something wrong with it 😉 Beautiful photos, it looks like your timing was right on. You hit the jackpot here! The photo of the fruit orchard is stunning. That hike through Spring Canyon and the Chimney Rock loop is a favorite of our too. 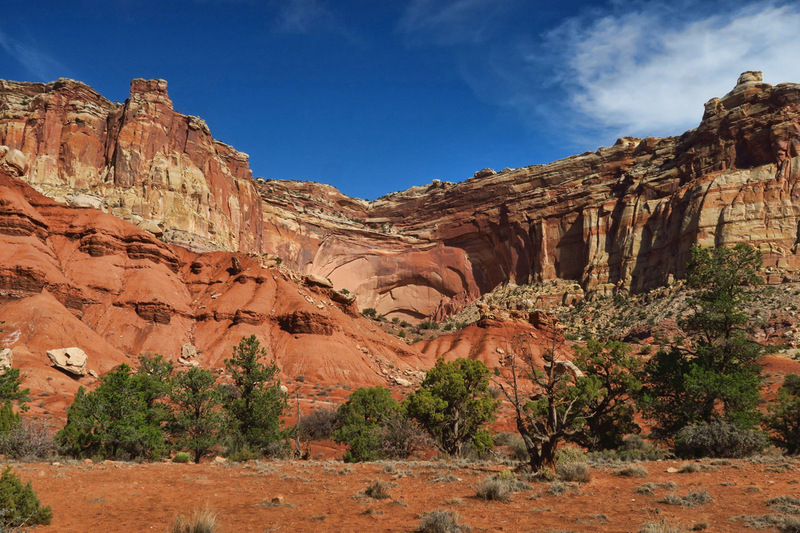 I don’t believe I’ve ever visited Capitol Reef and found it overrun with people, it is a special place. Beautiful description! Great salve for being stuck at home with a ” stupidly self destroyed” tibia and seeing my 06 View out the window just dying to hit the road. My wife and I spent many nights in the Cottonwoods Campgrounds at the BBNP. On the banks of the Rio Grande where if the wind was right you could her music from the little Mexican village of Santa Elena. And that beautiful cathedral of cottonwoods! with all the golden light pouring through in the fall! There would usually be more coyotes around than people in the fall. Unfortunately the NPS cut most of them down years ago,,,,, they told me it was because they were getting too old and branches might fall out and hit people! 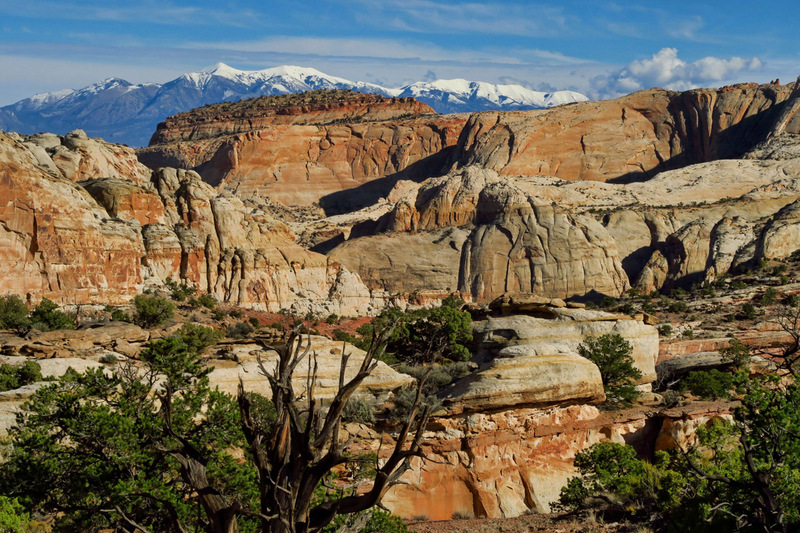 Thankfully they seem to have a better plan at Capitol Reef! Thanks so much for bringing back great memories and adding another place to my list of must visits! Just remembered the counterpoint to your fresh peach pie! It was a stop in Marathon on the way to the park at Shirley’s Burnt Biscuit for fried pies! Peach was my favorite but you had to eat them in a day or two because she used so much lard in baking the bottom of the paper sack would fall out! Lord they were good! Wild picked blackberry pie for breakfast is an annual pleasure. Just returned from a big round of family travel, not necessarily fun stuff but OK. 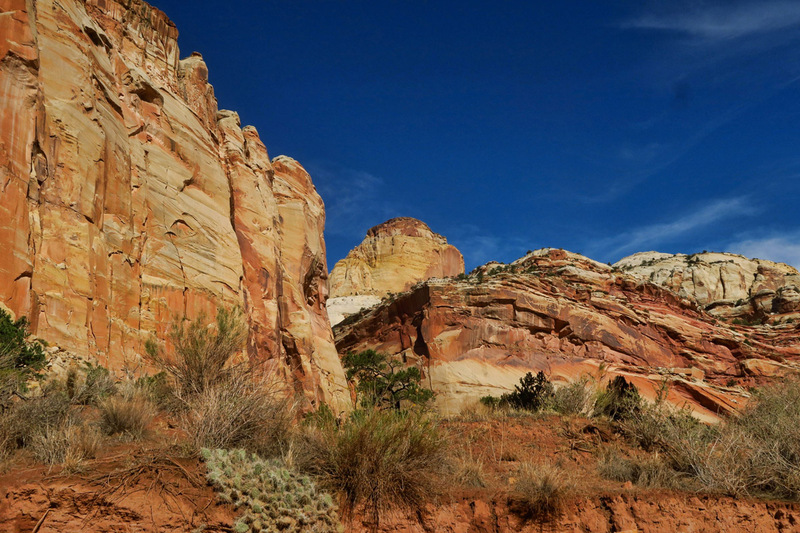 However, I still managed to cruise through your Capitol Reef photos and blogs and sigh a lot. You are in my most favorite place in the entire world. 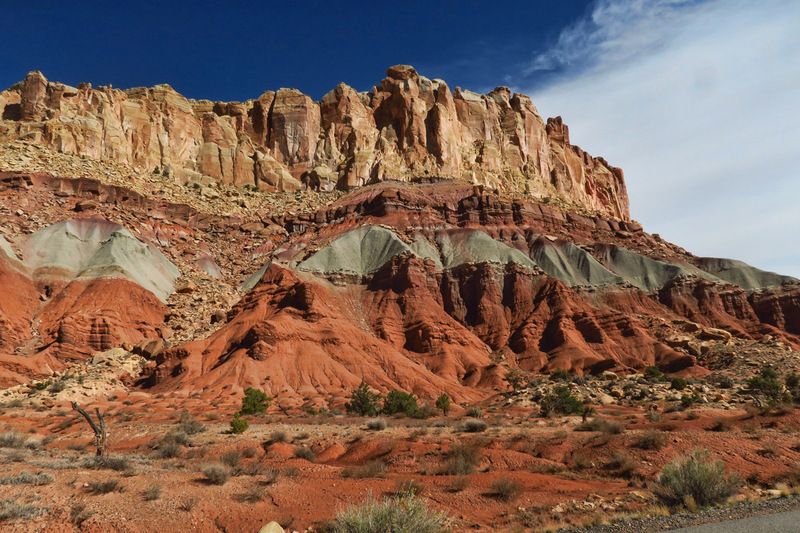 We are committed this time, a couple of weeks in Capitol Reef on our way to the Balloon Fest next October. As you said, perfect timing, and my favorite time to be there. Another beautiful post and prose. I envy your ability to enjoy this beauty, and am so happy you’re doing what you love! This area is gorgeous! As they say, “timing is everything” and yours was spot on Suzanne. The colors in your photos just blow my mind. 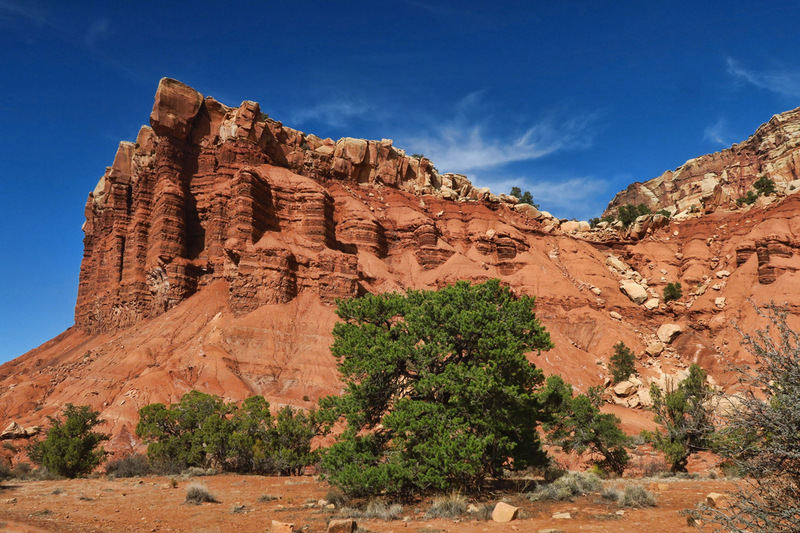 So glad you had such perfect weather for your time in Capitol Reef. Hope to see you soon in San Miguel! Travel safe…. Your timing was perfect! Love all the yellow:) This is just the most fabulous park and my favorite. The Golden Throne and Tanks were such fun hikes. Thanks for the memories! What a lovely post! While enjoying it I was reminded of my favorite (non) American standard, “Autumn Leaves”, by song writer Johnny Mercer. I was compelled to dig a bit further into the history of the song and found that Mercer “adapted” English lyrics from the French song “Les Feuilles Mortes” (literally, “The Dead Leaves”) written by Jacques Prévert. Beautuful pictures and descriptions of the trails. 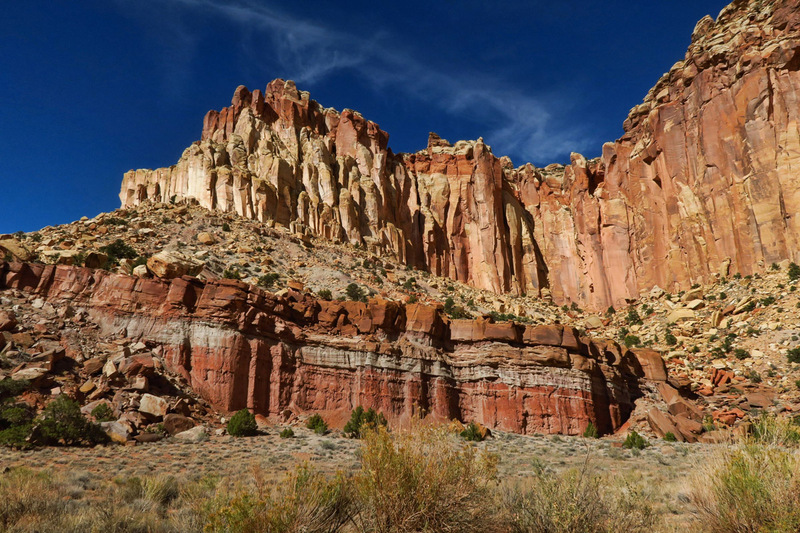 My visit to Capitol Reef in 2014 was cut short because of flash flooding, I definitely need to return.